LUNCH BUNCH The Jackson Café is staffed by formerly homeless. There are places in San Rafael and Marin County where you can go for high-minded ethnic cuisine, but the Jackson Café is not one of them. You're here for lunch, and lunch is a square deal, available five affordable days a week. The cafe is located within the Whistlestop nonprofit service center in San Rafael, a sprawling building across from the bustling San Rafael transit center. The Whistlestop is run by the Marin Senior Coordinating Council, a nonprofit that assists the elderly and disabled of Marin County. There's a library and other services in half of the building, which has been helping folks out for 60 years. 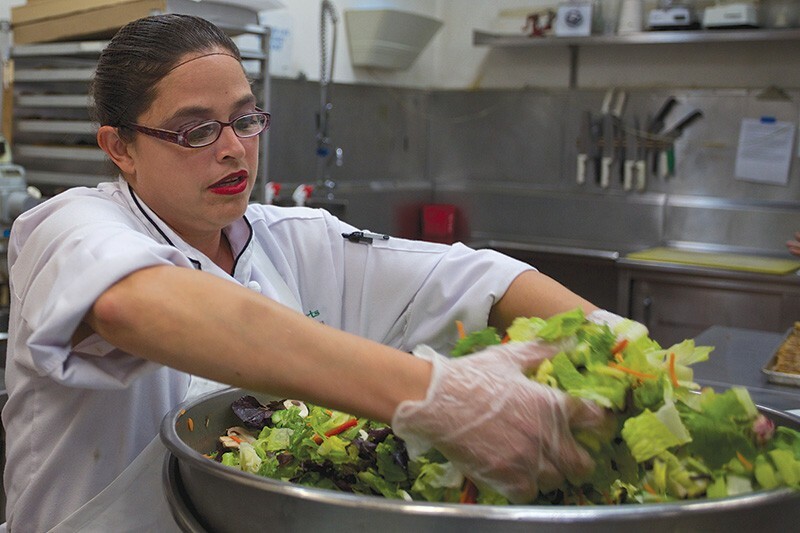 The Jackson Café is operated in a partnership with the nonprofit Homeward Bound of Marin and its Fresh Starts Culinary Academy, in Novato. The program offers job training and a safe-kitchen certification for students who were once homeless and perhaps wandering around the San Rafael transit center looking to catch a break, if not the bus. This is truly the wandering-eyeball part of town, where on any given morning you'll see a variety of folks waiting and wheezing in the bustle of exhaust fumes, doing variations on the pathos hustle. They're waiting for the bus or are otherwise caught in the transient thrum of adjacent Highway 101, with its road stank and all the down-and-out fixings: overstuffed backpacks and smelly shoes, cigarette ends plucked from the trash, you got a quarter? "The Jackson Café is oftentimes their first work experience," says Amanda Denny, marketing and communications specialist at Whistlestop. "This really offers that bridge from being homeless, from being unemployed—to being educated and having some work experience that you can demonstrate on a résumé." The Jackson Café is where you go to rest them weary dogs, to unload yourself of a mere $7 (for nonmembers) and have a solid lunch before getting on with the business of the day. The ceiling is kind of low and you feel like you're maybe in a Sarajevo Holiday Inn conference room, circa 1992. But the vibe is one of rampant humility and human concern. And at any moment you expect someone to jump up and shout "Bingo!" A typical week at the Jackson Café might find Moroccon chicken on Monday; some spinach ravioli on Tuesday, a plank of whitefish on Wednesday. This month there was an Oktoberfest bratwurst one Thursday and a poached salmon for the Friday crowd. Regular menu items include grilled ham-and-cheese sammiches, burgers, $5 soup-sandwich combos and a $2 fruit cup. Jackson Cafe, 930 Tamalpais Ave., San Rafael. 415.454.0964.